Maddix Park | Dungey Does It ! Glen Helen’s Talladega Turn was painted blue and orange in the first 450MX moto of the Lucas Oil Pro Motocross Championship. JGR Toyota/Yamaha’s Josh Grant and Phil Nicoletti held the first two positions over Red Bull KTM’s Ken Roczen and Ryan Dungey through the first turn and beyond. Grant opened up a lead over the field as the two KTM riders battled with his teammate for second. Nicoletti began to fade, allowing Roczen, Dungey, Justin Barcia and James Stewart access to the top five in quick succession. 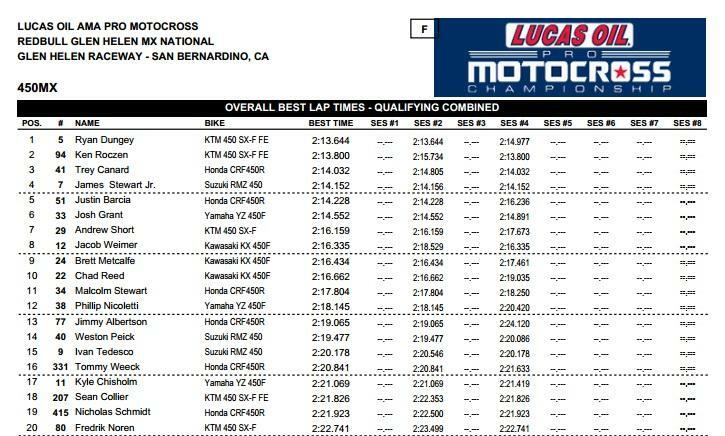 Trey Canard made quick work to catch up to that top-five group as well. Stewart took the inside through Talladega Turn around Barcia for fourth, but a few laps later, Canard passed Barcia and later tangled with Stewart. Both riders went down in a sandy corner following the finish line area. Barcia looked to be set for a solid fourth-place finish—Grant, Roczen and Dungey were long gone—but suffered a mechanical DNF late in the race. Andrew Short would succumb to the same fate moments later in the exact same section. This time around it was the orange bikes up front through Talladega Turn. 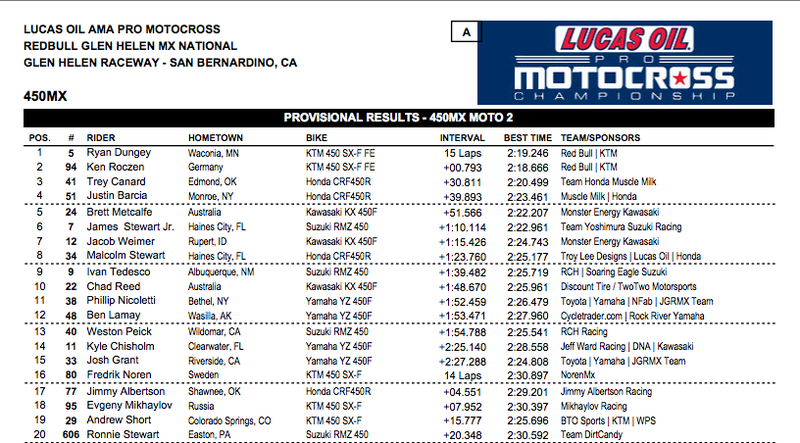 Ken Roczen edged out Red Bull KTM teammate Ryan Dungey for the early lead. Honda Muscle Milk’s Trey Canard followed the duo up in third, but the KTM riders slowly began to separate themselves from the field as they clicked off laps in the second moto. 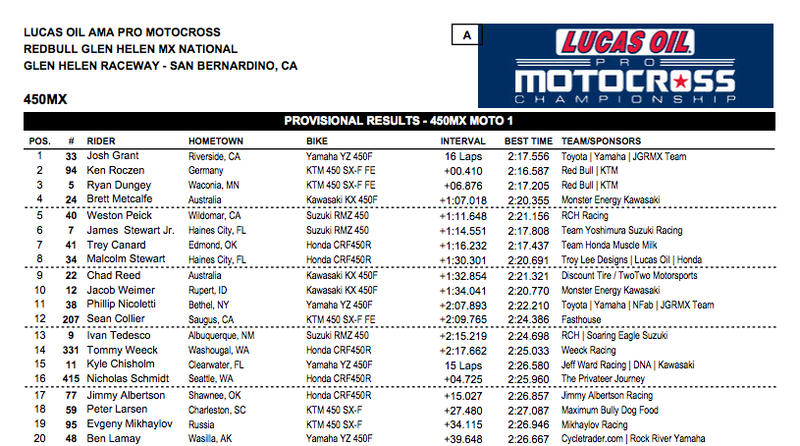 Dungey shadowed Roczen for the majority of the moto. He’d oftentimes lose ground on Roczen, but would find other areas of the track to regain it. Lapped traffic became a factor for Dungey later in the moto, and even though lapped traffic is typically a make-or-break factor for the Minnesota native, he rallied to keep Roczen in his sights. Similar to the first-moto battle between Josh Grant and Roczen, the two leading KTM riders didn’t really turn on the heat until the two-lap board came out. They drag raced side by side up Mt. Saint Helens, but Roczen held the fast line going into the hairpin at the top of the hill to exit out front. Dungey stayed all over Roczen as they entered the last lap, but whether or not he’d be able to pull the trigger was up to question. Welcome to the race day feed from round one of the 2014 Lucas Oil Pro Motocross Championship, coming to you from Glen Helen Raceway in Southern California. The air is cool and crisp, the track is absolutely stunning and the smell of race gas, mixed with the scent of blooming desert flowers, is in the air. In short, it’s a perfect day for racing, and everything this venue is known for—a spectacular, ultra-fast banked first turn, huge hills and massive elevation drops—are all on point today. The big hills are quite steep too. How steep? Fire hoses have been fastened to hillsides in the steepest places just so spectators can get up them (expect more than a few drunken spectators to crash out and DNF today) and some of the track Mules are unable to get to the top of the hills. The dirt is fantastic too, and right now is holding the perfect amount of moisture. Big ruts have also developed, and the track is going to get downright nasty and punishing when the world’s fastest riders pound out their motos this afternoon. Be sure to check this feed often and follow us on Twitter (@racerxonline) for news on what’s happening at round one. For full qualifying results, go here.